Kino Flo Lighting Systems partners with BlockBattery for newly introduced KF21 (NiMH) battery systems for its LED line. The Kino Flo/BlockBattery systems are designed to work with the following Kino Flo LED products with DC capability: Celeb 250 LED DMX Diva-Lite 20 & 30 LED DMX FreeStyle 31 & 21 LED DMX Select 20 & 30 LED DMX. Charge time is only 1.5 hours versus Lithium batteries that take approximately 4 hours to fully charge. Unlike lithium batteries, the Kino Flo/BlockBattery is travel friendly with no travel restrictions. 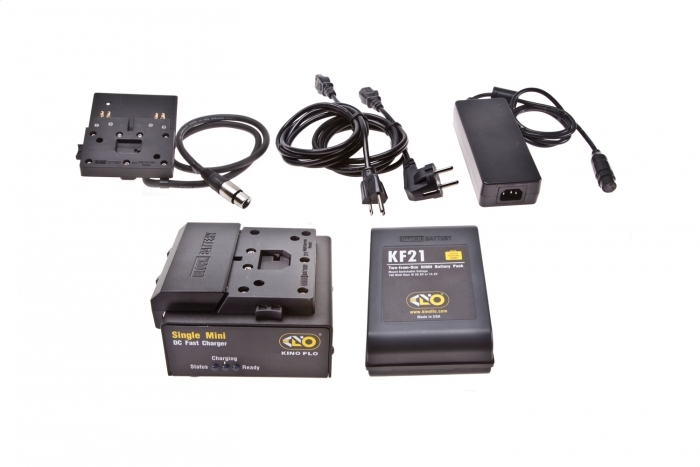 In addition to powering 28.8V, battery adapters may be used to access 14.4V to be used with products with 14.4V input. It’s like having two batteries for the price of one!